BrewCity Ball CMS - So who's got next? With today's very awkward, very odd press conference over, Loyola is now a former Horizon League member. So, we move on. Losing Loyola is certainly not the worst thing in the world; it's not like losing Butler, or even like losing UIC would have been. But these are the times, and we move on. So where to next? With Butler and Loyola gone, it's kind of exciting to think of what schools the Horizon League could be adding to the conference. We've taken a look at it many times before, but the news of Loyola's departure has given me renewed vigor. Sports - What sports do these schools have? Baseball needs to find a new member or else it will lose the automatic bid to the NCAA Tournament. Softball just lost Loyola as a member, and we need to make sure the key Horizon sports in basketball, soccer and baseball are available. Do they have a sport that will drag down the rest of their program financially? Facilities - Loyola would not be going to the MVC without the major upgrade to their facilities. For the Horizon League, we need to make sure we are following the same path and bringing in schools that have good enough facilities. Location - There's a reason Gonzaga isn't in the Big East, and it has nothing to do with their program. It's about location. The Horizon League needs to add programs that will keep the travel budget within a reasonable number. Airport hubs are important, but land miles are important as well - not all teams will be traveling by plane. Budget - How much does the school spend in athletics? This is a key indicator in telling if a school is committed to sports or not. How is their men's basketball budget? Is it comparable or better than the Horizon League? Success - Is this a team that has proven they can take the ball and run with it? Have they won at the D-I level on a national stage? How are they in basketball, soccer and baseball? Will they compete for McCafferty Trophies? Brand - Does this school's branding scream "high-major," "mid-major," or "low-major?" Is the school taking steps to discern themselves from others? Will they be able to market themselves well in the Horizon League? Effect - What effect does adding this school have to do with the Horizon League? Will fans and the public see these schools as an improvement for the conference? Do they elevate the conference, ranked 12th in the RPI? Could their academics help create research partnerships within the Horizon League? These are the tools I plan to use to break down every possible new member of the Horizon League. This is going to be a long list, so be prepared to bookmark this page and return to it later if you don't have time to read. As I said, these will be added on a scale of 1-10 with 10 being the highest and 1 being the lowest. Of the seven categories, none will be weighted any more than the other. We don't need this to be terribly scientific, just organized and able to give us an idea of what we're looking for and what these schools provide. Sports - NDSU sponsors all Horizon League sports except men's soccer, swimming and diving, or women's tennis. The Horizon League is in no danger of losing its automatic bid in these sports, so good for the Bison. They do, however, sponsor football, which has been a drag on many an FCS athletics budget and could hurt the Bison in the Horizon, as it has with Youngstown State, a fellow football goliath. The possibility of the Bison scarpering to the FBS gang of five conference could be there, but I doubt they'd find a better home than the Horizon. Score: 8. Facilities - This is where NDSU makes its bank. The university is in the closing stages of raising money to finish off a total renovation of the inside of Bison Sports Arena, their home for basketball. I joined a group of Panthers in making the trip up there for a game a few years ago, and their arena could best be described as a Sam's Club with some bleachers thrown in. This improvement is a huge deal for the Bison and will give them a big leg up in getting in. Score: 10. Location - While they are improving their facilities greatly, they have no way of picking the university up and moving it closer. The Bison are in Fargo, an eight-hour drive from Milwaukee or Green Bay; they would basically be an outpost in the Horizon League. Their regional airport is not much better than Austin Streubel Airport in Green Bay; so unless you're flying out of O'Hare, you better have a charter jet to get into town. Score: 4. Budget - The athletics budget soars at over $16 million, but a large chunk of that goes to football. Men's basketball's budget hovers just over $1 million, which would need to be upgraded to avoid the scary comparisons to Youngstown State. Score: 5. Success - The Bison have been to the NCAA Tournament, once, for the annual Summit schellacking. NDSU had a pretty great class of players that redshirted their first year so they could have a chance to play in the tournament as fifth-year seniors when the Bison came off their probationary period. It was a great story, but we're betting the best years are ahead of NDSU with the $36 million facilities upgrade. Score: 6. Brand - The national NDSU brand is based on football, not basketball. The national brand of Fargo is based on Frances McDormand and William H. Macy. The Bison have work to do to become a national name, but they're not an unknown like some schools on this list. The Bison mascot is a great brand for a school from the Great Plains, and is the only Bison near the Horizon League. That would change if the Horizon adds Belmont, who is crosstown rivals with the Lipscomb Bison. Score: 6. Effect - This shows the Horizon League is serious about adding schools that are serious about basketball. If the conference gets a commitment to increase basketball funding the same way that Loyola committed money for the MVC, then I think this is a great catch. If they don't add to their budget, you can expect their basketball coach to get picked off by a MAC or MVC program following successful seasons. Score: 7. Sports - The Jackrabbits are one sport short of being a member of every Horizon League sport. Without men's soccer, SDSU is not a member in one of the Horizon League's premier sports. But that won't hurt their candidacy, as SDSU is in everything else. Football drags the budget down as does wrestling, but like NDSU they are showing they're committed to basketball. Score: 9. Facilities - Frost Arena is a decent mid-major sized arena that could potentially be a great home for the Horizon League Tournament. The Jackrabbits are mulling over the possibility of renovating the facility to add suites, more concession stands, more restrooms and premium seating. We think the Frost Arena is good enough for a "yay" vote, but a renovation would make it a "big yay." Score: 8. Location - Like NDSU, they'd be an outpost in the Horizon League, although you could safely assume that they would enter the conference as a pair. A big negative for the Jackrabbits is that their regional airport doesn't have any commercial flights into town, so unlike NDSU there would have to be a charter flight to get their by air. Distance is also a problem on the ground. You'd have to assume schools on the eastern bloc would be annoyed by adding schools so far away, but the commitment to basketball is almost there. Score: 3. Budget - At under $1 million for the men's basketball budget, the Jackrabbits are going to need to push their basketball budget up considerably if they're going to be a contender in the Horizon League. As long as the Jacks still play football, their budget in basketball is going to sag unless they pick up the entire program. They would be dead-last in budget in the Horizon League for men's basketball. Score: 4. Success - Finally in 2012, the Jacks made their first NCAA Tournament on the back of star guard Nate Wolters. Like NDSU, they took the obligatory pounding in the big dance and returned with their heads held high. In 2013, they did it again. In the Horizon League, we're used to being represented by winners - Butler may be gone, but Milwaukee and Cleveland State both have done well in the tournament. SDSU won't miss the Horizon based on their team. Score: 7. Brand - The SDSU brand is really not much to shout for. They are the only Jackrabbits in D-I, but they haven't made a splash in football or men's basketball and are overshadowed by South Dakota, a school that has made a name for itself with its big football victory over Minnesota. The Jacks helped themselves out with the tourney appearance this season, but they've got a ways to go. Their blue and yellow color scheme looks great on black uniforms. Negative points for sharing an acronym with San Diego State. Score: 5. Effect - Adding the Jackrabbits would be a positive step forward for the Horizon League. This is a school coming off an NCAA Tournament appearance, so it's already ahead of Loyola. It has the ability to be a big player in the conference, but with NDSU's facility upgrades, one has to expect that SDSU is the lesser of the two Dakota schools. Score: 6. Sports - The Kangaroos of UMKC field all Horizon League sports except swimming and diving, which is not in danger of falling below NCAA conference membership standards. The Kangaroos accepted an invite to the WAC, but they match up well with the Horizon League in sports. They also are not bogged down by a big killer in football or ice hockey. Score: 10. Facilities - UMKC is mulling a move to the downtown Municipal Auditorium, an old 7,300-seat arena that briefly was the home of the Kansas City (now Sacramento) Kings. The program spent the last few years at Swinney Rec on-campus, which is smaller than the Klotsche Center and is their practice facility. Score: 5. Location - Kansas City is a long trek for fans - something like an 8-hour drive from Milwaukee so it's a flier if possible. The good news is the airport hub is good and it's fairly cheap to fly in and out. Extra points for being closer to Wright State and Valpo than either Dakota school. Score: 6. Budget - This is a school that has acknowledged its shortcomings in facilities and instead put that money into beefing up its basketball budget. The $1.852 million budget would be middle of the pack in the Horizon League, which is better than many possible additions. They also aren't shoveling cash into an albatross football program or ice hockey program. Score: 7. Success - Almost none to speak of. The Kangaroos have hired Louisville assistant Kareem Richardson, so they hope he can guide them to the next level. That could be the Horizon League. Score: 2. Brand - People may cringe at the four-letter acronym, but I personally love the UMKC name. Is anyone in the country unaware of where UMKC is? KC = Kansas City. It's easily branded both nationally and locally, and they have a winning mascot in the Kangaroos, shortened to Roos. Score: 8. Effect - I think we see that UMKC is serious about moving up with their hire of Richardson. I think we see that the Kangaroos are serious about moving up by getting back downtown. They don't have a beautiful arena or a ton of history, but the Roos are very fitting with the Horizon League's historical profile of a collection of urban research universities. Getting into the Kansas City market can only help recruiting - Milwaukee just picked up JR Lyle, and Green Bay had Rahmon Fletcher, a KC native. They've got work to do, but they help us past the Loyola loss. Score: 5. Sports - Denver is a real special case in potential schools. They do not carry baseball - a big downer for potential Horizon membership - and they also carry two large money-eaters in ice hockey and lacrosse. Both of the latter sports are revenue-producing, so it's not as much of a drain as football, but the attention is surely not in men's basketball. The Pioneers are also the Duke of NCAA skiing, having won 19 national titles. None of these sports helps the Horizon League. Score: 4. Facilities - Magness Arena is relatively new, built in the late 1990's, and it's primarily a hockey facility. So bring a coat if you have floor seats. It seats over 7,000 and was voted "best new sports venue" by Westward. Fun fact: it was the home to the first of the three 2012 Presidential debates. Score: 8. Location - Like the previous schools on this list, Denver is a major outpost program if it's in the Horizon League. The thing it does have going for it, however, is an extremely prominent airport that is a major flying hub for the country. Getting a flight into Denver is easy. Big downer, however, is that almost every team would have to fly in; it's a full day's travel by bus. Score: 4. Budget - The basketball budget of $2,512,912 is a big testament to the university's plan to invest in the sport. It's more than double NDSU and SDSU, and significantly higher than UMKC. Much of that likely comes from travel expenses, as it's a long distance to go for the program to pretty much any school. It also has a lot to do with the fact that the school is jumping to its third conference in as many years next season. Even still, this is a major basketball budget that would be close to the top in the Horizon League. Score: 10. Success - Not much to speak of until this year, when Denver finally broke through and got to the postseason under coach Joe Scott. This was their third NIT appearance and they got their first victory by ousting Ohio. Score: 5. Brand - Denver is a name people recognize, even if it's not by the name of the school. The Pioneers are the only such school outside of Sacred Heart (why is a school on the east coast called the Pioneers?). It fits the Horizon brand well - urban research school. It's private, so it will appease Detroit and Valpo, and it has a nationally prominent ice hockey program, so people in Wisconsin that are Badger ice hockey fans will remember their former conference foe in that sport. Score: 8. Effect - Denver's recruiting pool is fairly decent, certainly better than Dakota, but it's not a big bonus. The budget shows they're serious and the team finally seems to be clicking, but I wonder about this nomadic program - will they ever be happy in the Horizon League? We'll have to see. Score: 5. Sports - Sponsors every sport but swimming and diving. The Cougars are helped tremendously by the fact that the university takes a great amount of pride in their soccer program, which plays in the MVC. Any addition of the school to the Horizon League, in my eyes, would need to bring over that program from the MVC. The Cougars are not bogged down by any albatross program. Score: 10. Facilities - Unlike most of the facilities on this list, I've actually been to the Vadalabene Center on campus at SIUe. The place is a great place to sit and watch a basketball game, but the concessions are lacking and there are no suites. The ticket office on the outside, like an old-time movie theater, is probably the coolest thing about it. I wouldn't require an upgrade, but it would be nice if the school put money into making the facility better. Score: 6. Location - Most people look at the name and think that it is in the middle of nowhere like Carbondale, but in actuality the school is a hop, skip and a jump from St. Louis. The Cougars are helpful in the area recruiting market - Milwaukee signed a home-and-home with them a few years ago precisely to help recruit the Boga brothers and to get Tony Meier a game by home. The location isn't perfect because it still is four hours away from UIC, five from Milwaukee and Valpo and six from Wright State, but the school is not going to lose out based on location. Score: 8. Budget - Like most provisional schools, its $865,961 men's basketball budget leaves a lot to be desired. I wonder if the university will be able to move forward with increasing its budget to be at a Horizon League level. If they can get the basketball budget up to $1.5 million, it'd make me breathe a lot easier. Score: 3. Success - There's not much to speak of, but then again they just got to D-I a few years ago. The Vadalabene Center is good enough to play in and the Cougars could be important in the St. Louis market, but it's hard to predict where they'll be. My guess is they'll spin their wheels unless they can take care of their budget and their brand. Score: 3. Brand - Their Cougar logo doesn't look so much like a cougar as it does like the gopher from Caddy Shack, but that is the least of their worries. SIU-Edwardsville has the distinct problem of being the only directional, hyphenated small name town school in D-I. It's incredible that the university chose to go to Division I without at least considering changing its name. It would probably be better as Southwestern Illinois than SIUe. I would consider a name connecting it to St. Louis - like Gateway University or Mound University or Crossroads College. Then again, those names make it sound like an online school. The problem is that Edwardsville isn't anything to shake a stick at. Score: 1. Effect - Moving on SIUe right now would be a mistake; that isn't to say they can't be powerful in the future. A serious rebranding of the university is in order, and Cougars (like Panthers) is such a common name. The one major benefit adding SIUe would bring is that soccer - which is important at Milwaukee and UIC - gets elevated in the Horizon League. It opens up the St. Louis recruiting market, which is better than most for mid-major recruiting. Hopefully they get their branding rewired, because they have the possibility of being a major player on the mid-major level if they ever figure it out. Score: 3. Sports - The Racers don't play men's soccer or men's track or swimming and diving, but only men's soccer is a bummer. Murray State is a football school, but its basketball program is the big chalupa in town. Score: 7. Facilities - The CFSB Center is a big building, seating well over 8,000 for basketball. The Racers routinely fill the arena past halfway, and by all accounts it is an exciting venue. It's size is enough to grow the program with a move to a better conference. Score: 8. Location - In the western corner of Kentucky, Murray is pretty far from any major city. It's distance makes it somewhat unlikely to join the Horizon League unless it is joined by another program in the area. There is a small airport that charter flights can land in, but commercial flights land hours away; this is a place most sports would bus to, as it's a few hours south of Indianapolis. Score: 6. Budget - At $2,033,196, the budget is spectacular. Murray State University is very committed to the success of its basketball program; without a huge endowment or big academic programs, the university uses the team as its calling card. If Murray had 400,000 people in it, the program would be dominant. They spend more than enough to be considered a great candidate. Score: 9. Success - We're finally onto some programs that are dynamite at men's basketball. The Racers have been to the NCAA tournament five times since 2000 and 23 times overall out of the tiny Ohio Valley Conference. They've very much been the kings of that conference, getting to the tournament no matter who the coach is at any given time. The last bunch of coaches have been successful; Billy Kennedy is now at Texas A&M, Mick Cronin now runs Cincinnati. Steve Prohm now has his own success. This is the school that forced out Tevester Anderson for finishing 4th in the conference in 2002-03 one year after going to the NCAA Tournament. Score: 10. Brand - The Racers are a unique name that calls to Kentucky's thoroughbred racing history. 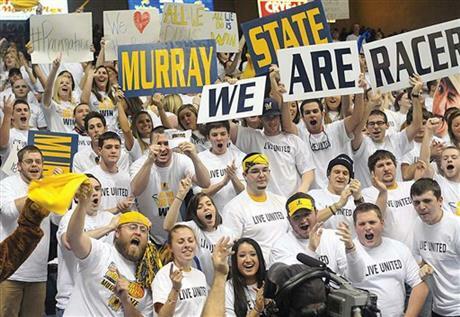 Murray State itself is the epitome of what a small-town mid-major can become if they own their town. The program is nationally recognized and successful. Score: 10. Effect - Adding Murray State would be a coup for the Horizon League. Getting into the fertile Kentucky recruiting market would be a boon, and adding a program that has legitimate title aspirations annually would be big. The Racers are founding members of the OVC, and it's a tough sell with Butler and Loyola gone. But Murray State is itching to be more than a one-and-done program every year, and joining with the Horizon League would get them moving in the right direction. Score: 10. Sports - No swimming and diving, no indoor track and field (outdoor they have). The Bruins are not bogged down by a football or hockey program, and they have the distinction of being an excellent baseball program. They just moved into the Ohio Valley Conference for the 2012-13 season. Score: 10. Facilities - The Curb Event Center is an outstanding facility with a wonderful exterior design that sits right on campus in Nashville. The Bruins play in the 5,000-seat arena, almost a perfect size for a Horizon League program. The building is somewhat new and is only the home to basketball. Score: 10. Location - Nashville is more than a stone's throw away, but like Denver and Kansas City it has a commercial airport. The distance is actually not as far for a school like Wright State, but if Belmont is going to come to the Horizon League, they're going to need a travel partner. Score: 6. Budget - The basketball budget of $2,213,543 is outstanding. It would be third in the Horizon League, only chasing Detroit and Cleveland State. The university is very committed to basketball, moving up from the Atlantic Sun conference to the Ohio Valley. Perhaps they'd like to take a further step up? Score: 10. Success - Here's another program that is a proven winner. They may not have the deep history of Murray State, but no one can argue that the Bruins haven't become a great program in D-I. They reached their sixth NCAA Tournament this year in their first in the OVC, topping Murray State and Isaiah Canaan. Rick Byrd is extremely comfortable in Nashville, having led the Bruins for 27 years. They're still chasing that ever-elusive first NCAA tournament victory. Perhaps another move up in conferences will help them get a better seed. Score: 9. Brand - The Duke game in the NCAA Tournament brought the Bruins to the national spotlight. Besides that they haven't been particularly successful in the big dance, losing the other five games by double digits. But Belmont is a brand people recognize, at an urban university befitting a Horizon League member. Score: 9. Effect - Nashville's recruiting market would be a big help for schools in the Horizon who are losing some footing in Chicago. The conference would be adding a program that just breathes basketball, and plays pretty darn good baseball. This would be a huge deal for Wright State, who wants a strong baseball conference to stick around. The basketball, however, is the real deal. Expect the Horizon League to elevate if they add Belmont. Score: 10. Sports - Almost blow for blow like Belmont, except they also carry a football program. It's not so much an albatross because the football program is non-scholarship Pioneer League, which means you're paying for the football team out of tuition from the players themselves. Still, football carries almost $1 million in expenses. Score: 9. Facilities - The Eagles play their games in the Ellis Johnson Arena, a 6,500-seat facility that isn't all that special. It's a great size for a Horizon League gym, but the area isn't home to that many people and maybe would be better at 4,000. Score: 7. Location - Morehead is the middle of nowhere in eastern Kentucky, halfway between Huntington, West Virginia and Lexington. The Eagles would be somewhat of a travel partner for Wright State, and definitely a better trek for the Ohio schools and Detroit. there is no airport to speak of; in other words, you're busing into town. Score: 6. Budget - The basketball budget of $1,287,651 would be lower than every Horizon League school except for Youngstown State. The team would need to have a higher budget to be a consistent competitor for Horizon League titles, and I'm not sure the area would be able to take it. The town is small, the region is small, and the university is of below-average size. Score: 5. Success - Unlike Murray State and definitely unlike Belmont, Murray State tends to wallop people on the head when they get to the tournament. The program has two recent NCAA Tournament bids, although how much of those were based on Kenneth Faried and not the program infrastructure, I don't know. The Eagles beat Alabama State in the play-in game in 2009 before taking Louisville down in a shocker in 2011. As I said, MSU had a lot of its success based on Kenneth Faried, who passed Tim Duncan to become the NCAA's all-time leading rebounder and is now enjoying an NBA career. Score: 8. Brand - Morehead State's unfortunate name graces the pre-frayed ball caps of many a frat boy in this country. The Eagles have one of the most popular mascots in the country, and there's nothing about Morehead as a town to get excited about. The program probably belongs in the lesser OVC, and would have a lot better success if Murray State and Belmont left for a more northern touch. Score: 4. Effect - Adding the Eagles would be hard, and I'm not quite sure if the effect is what we'd like. The Kentucky recruiting area is fertile, and that is a plus, but no more fertile than most schools on this list. Morehead State may have just caught lightning in a bottle with Faried, and they lost the coach that brought him in when Donnie Tyndall left for Southern Miss. Score: 4. Sports - Besides baseball, which it does not participate in, IUPUI runs the full gamut of Horizon League sports. Milwaukee, Wright State, and UIC all want to see a baseball program come into the conference, and the Jaguars don't play it. Otherwise, though, good school for the sports played. Score: 8. Facilities - I can't stress enough that the Jungle just isn't fit for the Horizon League. If IUPUI is going to be serious about being a Horizon League school, they'll need to get a bigger home than 1,200. 3,500 is okay, 4,500 is decent, 5,500 is probably the best size. The university is a great school despite its stigma, and it could use a facility to match. Unfortunately, there's just not a lot of money floating around in Indianapolis that isn't headed towards Butler. Score: 2. Location - The best location out of all the schools. Indianapolis is home to the Horizon League offices, it's a two-hour drive from Wright State, they have a natural travel partner in Valpo (although now with Loyola gone it looks like Valpo will team with UIC), and the Jaguars are close to the airport. Score: 10. Budget - With a men's basketball budget of $1,301,083, IUPUI is not going to be taken seriously as a potential Horizon League team. If they can boost their budget by 700k and get to the $2 million mark, they may have something. But this screams Summit. Score: 6. Success - The Jaguars have sent George Hill to the NBA and had the honor of being blown out by Kentucky in the first round in 2003, but besides that there is not much to speak of. Their soccer program is no great shakes, either. Score: 4. Brand - It's funny to say (oo-ee-poo-ee), but the brand might actually be pretty decent if the program matched it. Their Jaguars name is ho-hum even though it's not too popular. The further they get from their forgettable NCAA Tournament appearance, the more they become a footnote. Score: 4. Effect - It's safe to say that from the standpoint of every Horizon League fan base, adding IUPUI would be nothing short of catastrophic. The program hasn't been good for years, it doesn't fill a gym whose capacity is smaller than every Horizon school's average attendance, and it doesn't have the kind of budget to sustain a rise in a tougher conference. Score: 1. Sports - Besides swimming and diving, IPFW carries every Horizon League sport, including baseball. The Mastodons are not carrying an albatross sports program, so they match the Horizon League well. Score: 10. Facilities - IPFW has played at the cavernous War Memorial Arena for awhile, but they will be moving into the 2,700-seat on-campus Hillard Gates Sports Center for the upcoming season. It's probably the perfect size space for IPFW in the Summit League. If they want to be in the Horizon, they'd have to upgrade the space, but for the low-level they're at, it's not bad. Score: 3. Location - Fort Wayne is smack dab in the middle of the Horizon League footprint. It's a couple hours away from Valpo, Detroit, and Cleveland State, and a medium drive for everyone else besides Green Bay. Besides IUPUI, this is probably the best placed program. Score: 10. Budget - The entire athletics budget hovers around $7 million, which would be real low in the Horizon League. The basketball budget of $902,063 is even lower. Fort Wayne isn't a small town (255k), so it stands to reason that if the program were branded as Fort Wayne and the university could find a way to pump a considerable amount of money into the men's basketball program, they could turn that skiff around. Score: 3. Success - None to speak of. The IPFW program is unsuccessful in the Summit League, and expecting them to compete in the Horizon League in the next five years would be nothing short of wildly optimistic. The move on-campus is smart, now if they can pump money into the program, they may find themselves a winner down the road. Score: 2. Brand - The Mastodons has to be one of the coolest mascots in Division I. It has no Fort Wayne cultural connection, but it's definitely a great animal mascot. IPFW as a name, however, is not so great. The school really lacks an identity - or should I say, they lack a coveted identity. Fort Wayne is a rust belt town without a whole lot going on, so I'd be surprised if they would still be bad should the university pump the program full of money. Whoever is raising money for athletics at that school should get some help, because they're the only game in a significantly large town and they still can't grab the attention of the people. Score: 3. Effect - Like IUPUI, this would be a weight dragging on everyone. IPFW needs another ten years, a rebrand, and a bunch of money pumped into their program before they can get a seat at the mid-major big kids table. Not a total loss because their baseball team would save us from losing the automatic bid. Score: 2. Sports - Everything but swimming and diving. Is it just me or do a lot of these schools not carry swimming and diving? Northern Kentucky is halfway through reclassifying to Division I, and has long eyed the Horizon League as a potential destination. It's soccer program won the D-II national title in 2010, which has to be music to the ears of Kris Kelderman and Kyle Zenoni. They carry all other Horizon League sports, so they're on my radar. Score: 10. Facilities - This is a school that handled the D-I transition right. Using the move as a chance to spur on donors, NKU built the Bank of Kentucky Center on campus at $60 million and 9,400 seats. They were set to join the OVC, but were rejected and delayed moving up a year because the OVC schools whined about the Norse having a recruiting advantage. I'm sold. Score: 10. Location - You may think that Northern Kentucky sounds like the middle of nowhere, but you'd be wrong. NKU resides in Highland Heights, a middle class suburb of Cincinnati, Ohio. NKU is just 10 minutes from Cincinnati proper, and the campus is a 16 minute drive to Xavier's campus. The campus is just an hour drive away from Wright State University, which makes it the perfect candidate to be WSU's travel partner. They expand the Horizon League's footprint to the Cincinnati market, which is not an insignificant recruiting area. It's in excellent placement. Score: 10. Budget - As a transitional D-I program, NKU only has a basketball budget of $1,110,569. The Norse have increased their budget a bit each year, and likely would increase it again by joining the Horizon League. The conference may want to get some kind of commitment before going forward, as this is something of a hangup today. Score: 5. Success - There's really not much to talk about, because their program only became Division I this season and will not become a full D-I member until 2016. It's due to this that the Norse get a low score, as they wouldn't add to the Horizon League's postseason for a few years as part of their probationary period. Score: 1. Brand - The Norse nickname is pretty solid; while the school would be the southernmost in the conference, it is a nod to the school's directional name. NKU itself isn't entirely great, but I don't think the name WKU has held back the Hilltoppers. They'll need a few years to put a national name on their program, but they could be a fast riser. Score: 6. Effect - It's likely that most fans in the Horizon League would shrug at NKU next to Belmont, Oakland or Murray State. People in Horizon League cities wouldn't have much of a reaction. But NKU has an extremely high ceiling. The Bank of Kentucky Center would be the best Horizon League facility on Day 1 (that is, unless we run the Cell). All of a sudden, the Cincinnati media is covering our conference. If NKU were a basketball recruit, he'd be the 6'10'', 245-pound power forward with tons of strength and speed but only played one season of basketball in high school. They're a project, but my lord they could be a beast down the road. Not to mention, they'd probably trip over their feet running to sign the papers to get in the conference. Score: 7. Sports - RMU has a ton of sports programs. The Colonials don't have baseball or swimming and diving, which of course is only a hindrance with the former. RMU carries football, ice hockey and lacrosse, three albatross programs that pick up the athletics budget in a hurry. Score: 6. Facilities - The Charles L. Sewall Center is a small, 3,000-seat multipurpose gym with a somewhat boring crowd. The gym is not much different than Milwaukee's Klotsche Center, and we all know how much the Panthers enjoy that house. Score: 3. Location - Like NKU, Robert Morris would expand the Horizon League footprint into another major city while still being stunningly close to a conference staple; in this case, Youngstown State. The Penguins and Colonials are only an hour away from each other. RMU gets the added benefit of being right next to the airport. Score: 10. Budget - The athletics budget that soars close to $14 million is misleading, as football, ice hockey and lacrosse take up a considerable amount of the budget. It is what eastern schools do, however; ice hockey and lacrosse specifically are very popular in the northeast. The basketball budget of $1,356,722 is satisfactory if not solid. The Colonials have enough to get by if they choose to move to the Horizon League. Score: 6. Success - The Colonials have been one of the better programs in the NEC, although some of their recent success was had under Mike Rice, and I don't think they'll be inviting him to any cookouts. Being in a one-bid NEC, the Colonials have had the bad luck of winning four conference titles in the past six years yet only getting to the NCAA tournament twice, where they were ousted in the first round each time. Still, the showdown with Villanova in 2010 was memorable. Score: 8. Brand - RMU is like a lot of schools out east; they carry the name of an important figure in American history. This one is Robert Morris, whose pocketbook paid for much of the American Revolution. The Colonials, of course, are a fitting mascot for the school, and RMU would definitely separate itself from other Horizon League schools. Still, I wonder if they wouldn't prefer to be in an east coast conference. Score: 8. Effect - Besides Youngstown State, who would shout for joy, I don't see the rest of the conference getting too excited for Robert Morris. Attendance in our conference may be small, but it far outpaces most small private schools to the east. RMU's catalog of sports will make most Horizon League members cringe; I'm not quite sure if they have the commitment to basketball to make it work. Score: 5. So now that we've taken a look at all the potential Horizon League schools, what would be the scenarios that we could work out? Before we get to that, get over to the forum and give us your thoughts on our list.